Ambrose Wright’s attack on Cemetery Ridge on the second day of the Battle of Gettysburg. The sweeping Confederate attack of July 2 continued rolling northward en echelon, with brigades unleashed one by one similar to a falling row of dominos. The initial attack by Lt. Gen. James Longstreet’s First Corps was designed to defeat the enemy, capture important terrain, and siphon southward Federal reinforcements from other areas of the line. This, it was hoped, would weaken Cemetery Ridge and other points along the right side of the Federal line so that when those sectors were struck by subsequent assaults, they could be more easily broken and carried. Longstreet’s attack captured Devil’s Den, the Wheatfield, the Peach Orchard, and a large section of the enemy front along Emmitsburg Road. However, Little Round Top and the southern end of Cemetery Ridge remained in Federal hands. With Longstreet’s First Corps fully committed, the en echelon attack rolled northward into A. P. Hill’s Third Corps sector. Major General Richard H. Anderson kicked off Hill’s attack by launching Cadmus Wilcox’s and David Lang’s brigades against Emmitsburg Road. They helped Barksdale drive A. A. Humphreys’ division from its position along the road, but could not capture Cemetery Ridge. Anderson’s third brigade under Brig. Gen. Ambrose Wright stepped off Seminary Ridge between 6:15 and 6:30 p.m. to attack Cemetery Ridge. Wright’s line was aligned from left to right as follows: 48th Georgia – 3rd Georgia – 22nd Georgia. The 2nd Georgia Battalion, on the skirmish line behind a fence between Seminary Ridge and Emmitsburg Road, had orders to form on the left of the 48th Georgia as it swept by. Instead, the battalion lost its cohesion and dissolved into the rest of the advancing brigade. The brigade halted briefly to redress its lines when it reached the fence line held by the 2nd Georgia Battalion. When the attack was renewed, the Georgians came under fire from Lt. Fred Brown’s battery near the Codori House and Lt. Alonzo Cushing’s and Capt. William Arnold’s batteries on Cemetery Ridge. Undulations in the ground screened the Georgians at times, but they lost many men. Wright’s attack was so unexpected that Lieutenant Brown was only able to shift his left and center sections to meet the movement. 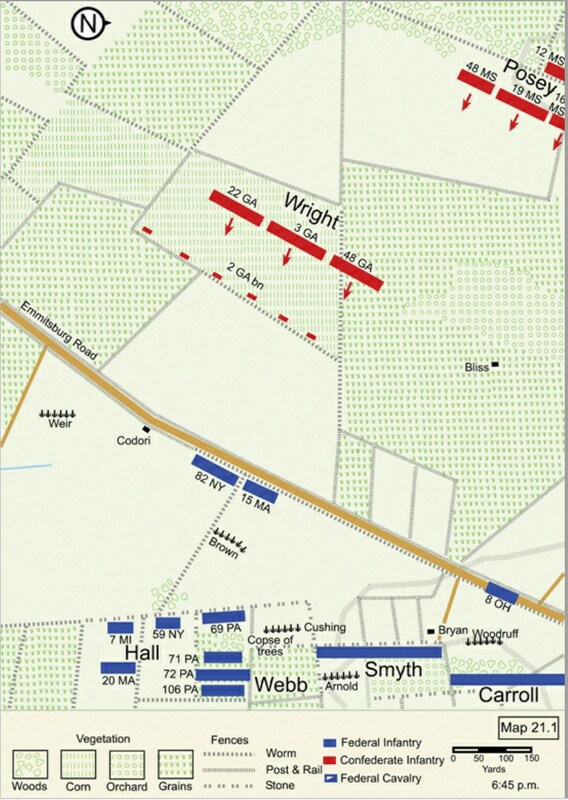 Portions of three Federal brigades lay in front of Wright’s Brigade. About 600 men of the 15th Massachusetts and 82nd New York (Brig. Gen. William Harrow’s brigade, Brig. Gen. John Gibbon’s division, II Corps) had formed in line along Emmitsburg Road just north of the Codori house. Gibbon sent them to this vulnerable position directly in front of the main Federal line on Cemetery Ridge to support the embattled III Corps fighting on his left. Realizing the precariousness of their situation, the veterans threw up breastworks. Flimsy at best, most did not survive the enemy artillery fire that rained down on them. From their position just east of Emmitsburg Road, however, the Federal infantrymen could not see Wright’s Georgians approach because tall grass obstructed their view. The Federal artillery on Cemetery Ridge continued firing, but the gunners occasionally misjudged the range (particularly when the Confederates neared the road) and some of the rounds dropped among their own troops. Three Federal regiments crouched behind a low stone wall on the forward slope of Cemetery Ridge. The 69th Pennsylvania, part of Brig. Gen. Alexander Webb’s Philadelphia Brigade, held the right of the line in front of the Copse of Trees, with the 7th Michigan and 59th New York of Col. Norman Hall’s brigade on the 69th’s left. 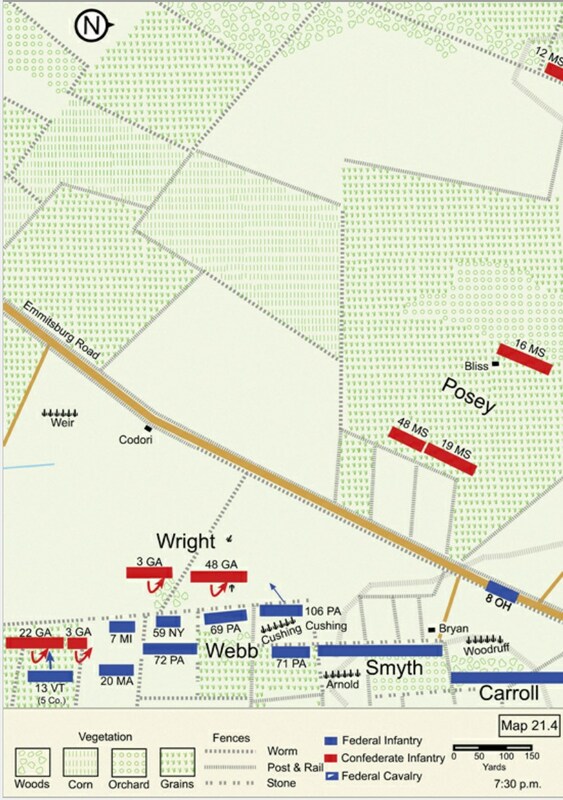 Webb’s other three regiments rested on the reverse slope of the ridge in column, aligned west to east as follows: 71st Pennsylvania – 72nd Pennsylvania – 106th Pennsylvania. Brigadier General Carnot Posey’s Brigade of Mississippians (Anderson’s Division) was next in line on Seminary Ridge to assault across the valley. The Mississippi regiments were arranged left to right as follows: 12th – 16th – 19th – 48th. The men captured the Bliss house and barn. The 19th Mississippi and a small part of the 48th Mississippi continued on “400 paces” beyond the farm buildings, where they opened fire on the gunners firing from Cemetery Ridge (probably Arnold’s battery), killing and wounding a number of them and driving the rest from their pieces. Brigadier General Ambrose Wright’s men let go a “demoniac yell” as they approached the two Federal regiments along Emmitsburg Road. The Massachusetts and New York veterans responded with a deadly volley, sending scores of Wright’s men sprawling in the grass. One Federal soldier called it “one of the most destructive volleys I ever witnessed … they hesitated, then reeled, they staggered and wavered slightly, yet there was no panic.” Undeterred, the Georgians pressed on. As the Confederates closed in on his exposed position, Lieutenant Brown ordered his men to limber up the guns and gallop to the rear. One gun commander decided to fire one last shot, but in the few seconds it took to do so, several horses fell wounded or killed. “The boys had to look out for themselves, as the Johnnies were all around us, and the bullets flew very lively,” he later wrote. Another gun was abandoned near the wall in front of the Federal position. When Wright’s men overran Brown’s two abandoned Napoleons, they tried to turn them around to fire at the Federal infantry on Cemetery Ridge. However, Alonza Cushing’s and William Arnold’s batteries pivoted and opened fire on Brown’s position with single canister charges. One of Cushing’s gunners wrote that “this movement was so rapidly executed that it staggered the Confederates (who, by the way, were in the act of training those pieces on us), and they fled to the rear in short order, totally broken up.” The rest of the Georgians, however, continued moving east against Cemetery Ridge. Posey’s Mississippi brigade, however, was not in position to support Wright’s stunning advance because Posey had lost control of his brigade. “Get up and fight!” yelled some of the Georgians when they realized that Posey’s Mississippians were not advancing with them on their left. “Come forward Mississippians!” screamed others. 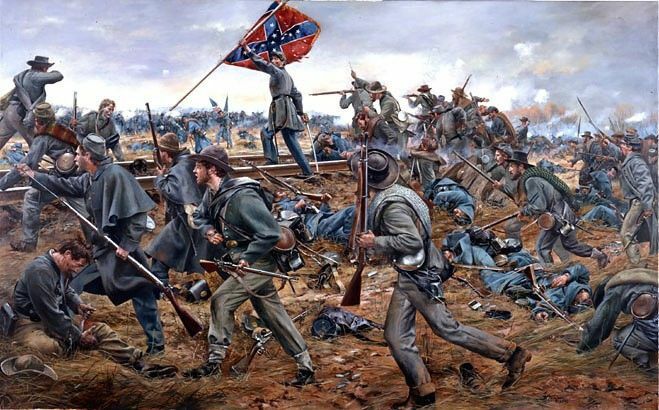 According to one veteran from the 48th Mississippi, at least part of his regiment formed on the left flank of the 48th Georgia as it rushed past them toward the ridge. The bulk of the Mississippi brigade, however, remained stationary around the Bliss buildings. In all likelihood, few if any Mississippians crossed Emmitsburg Road. The withdrawal of Colonel Lang’s Floridians on the right and General Posey’s failure to advance on the left meant that both of General Wright’s flanks were unprotected. He anxiously dispatched requests to his division commander, Richard Anderson, for reinforcements. Brigadier General Ambrose Wright’s Georgians were also exhausted. Winded from their trek from Seminary Ridge and their earlier attacks against the 15th Massachusetts, 82nd New York, and Brown’s battery, Wright’s men now faced the main Federal line at the base of Cemetery Ridge. A sizeable percentage of the brigade was already down, killed and wounded during the earlier fighting. The redoubtable Georgians pressed on “until they reach point-blank range of our rifles,” remembered the historian of the 69th Pennsylvania. “We met their charge with such a destroying fire that they were forced back in confusion. They rally again and make a second effort and again are their lines broken and thinned as we pour volley upon volley into their disordered rank, until they finally retire a dispirited mob.” The rhapsody of his memory notwithstanding, these steadfast Pennsylvania volleys did not stop the tramping Georgians, who continued moving toward the wall. Brigadier General Alexander Webb could see that his 69th Pennsylvania was about to be overwhelmed by the 48th Georgia and quickly called forward his three reserve regiments from the reverse slope of Cemetery Ridge. The 71st Pennsylvania took position behind a low stone fence to the right of the Copse of Trees, with its right flank connecting with Arnold’s battery. Alonzo Cushing’s guns were in front, farther down the slope. The 72nd Pennsylvania rushed to the left of the trees and the 106th Pennsylvania advanced to the crest of Cemetery Ridge, just to the right of the knot of timber that would soon become the most famous stand of trees in American military history. On the far left of the Federal line, the 7th Michigan and 59th New York poured a rapid and destructive fire into Wright’s 3rd and 22nd Georgia regiments. Behind these two regiments was the 20th Massachusetts, which also opened fire. Brown’s surviving guns stood unlimbered and ready for action just south of the Copse of Trees. The men of the 22nd Georgia and some of the 3rd Georgia noticed a gap in the line to the right of the 59th New York, where John Caldwell’s division was deployed before being sent south to bolster the III Corps. Driving toward it, the 22nd Georgia reached the base of Cemetery Ridge and shoved its way up the slope toward its summit. Five companies of the 13th Vermont, part of Brig. Gen. George Stannard’s brigade (Maj. Gen. Abner Doubleday’s Division, I Corps) was rushing toward Cemetery Ridge from Cemetery Hill. One of General Meade’s aides spied them earlier in the day and orders finally reached them to move immediately to Cemetery Ridge. As the 340 men approached the ridge, they encountered II Corps commander Maj. Gen. Winfield Hancock, who directed Col. Francis Randall and his men to the desired area. Although inexperienced in battle, Randall and his Vermont infantry were anxious to throw back the enemy assault. When it reached the top of the ridge to the right (north) of the Copse of Trees, the 106th Pennsylvania opened fire on the 48th Georgia (Ambrose Wright’s Brigade) as it approached the 69th Pennsylvania’s position behind the stone wall. Colonel William Curry, the 106th’s commander, observed a falter in the Georgians’ advance after these volleys and decided to seize the moment. “Seeing his lines waver, I ordered bayonets fixed and a charge to be made, which movement resulted in a complete success, the enemy retiring in confusion to his original position in the woods,” he later reported. The sight of the Pennsylvanians attacking their left flank with bayonets fixed, while the 69th Pennsylvania continued firing into their faces, was too much for the exhausted infantrymen of the 48th Georgia. They had reached the high-water mark of their attack. The Georgians began the long and dangerous retreat back to Seminary Ridge. Fifty-seven percent of the Southern regiment, together with its battle flag, remained on the slope of Cemetery Ridge. Not content to watch Wright’s men retreat, the victorious 106th and 71st Pennsylvania regiments followed after them. They swept past Brown’s cannons in the process and continued after the Georgians, many of whom had halted at the Codori farm. On the southern end of the line, the 13th Vermont surged forward, recapturing the guns of Weir’s battery overrun earlier in the evening. Wright’s losses were staggering. All but one of his regimental/battalion commanders were killed, and about half of his 1,400-man brigade had been killed, wounded, or captured. On the Federal side, the 15th Massachusetts and 82nd New York, formed along Emmitsburg Road, sustained losses approaching fifty-five percent. Despite withstanding the worst of Wright’s assault, the 69th Pennsylvania fought protected by a low stone wall and lost only about ten percent of its original complement of 284 men. Ambrose Wright complained bitterly about his lack of support on July 2, his barbs aimed squarely at Brig. Gen. Carnot Posey’s tactical failures. 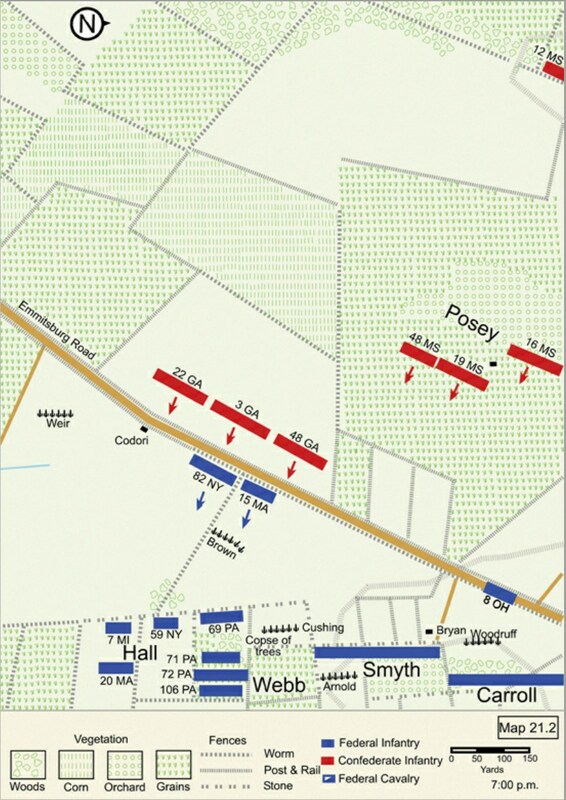 “I have not the slightest doubt but that I should have been able to have maintained my position on the heights, and secured the captured artillery, if there had been a protecting force on my left, or if the brigade on my right had not been forced to retire.” He had good cause to complain about Posey’s failure on his left. Poor brigade-level leadership allowed a skirmish line manned by the 8th Ohio to interrupt and stop the advance of Posey’s Mississippians. 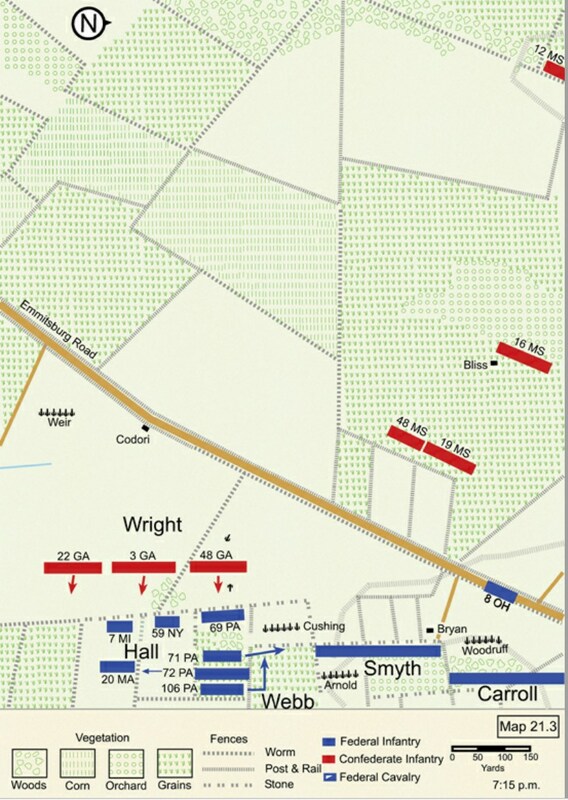 The brigade that had advanced on Wright’s right flank under Colonel Lang had been repulsed at Plum Run after heavy fighting. Although he did not know it on the evening of July 2, Wright would one day take some pride in accomplishing what many more troops under George Pickett and other commanders could not achieve the following day: reach the summit of Cemetery Ridge, however briefly. Wright never forgot his lost opportunity at Gettysburg.